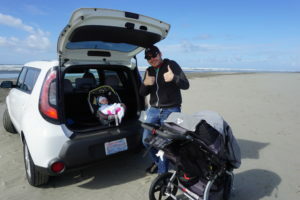 Before I had my daughter, I spent a lot of time traveling and I traveled often – local travel, domestic travel, international travel, I loved it all. I traveled so much that I developed a pretty solid travel philosophy and most of it revolved around traveling light. I haven’t checked a bag in almost 20 years, for instance. I also love to hit the road and just go from dawn to dusk, and sometimes long after that – full days filled with attractions and wandering, walking cobblestone streets in Europe until my feet feel like they might just fall off, leaving the hotel room in Vegas and not getting back for 12 hours, not bringing anything with me and figuring out meals along the way. Yeah…pretty sure those days are over for a while. I went to Europe for two months with just a backpack and a shoulder bag…seriously, this is like a trip to the store now. For me, traveling with a one-year-old is a lot of learning to adapt and learning to travel in new ways. I now need more STUFF for a trip to Target than I needed to backpack through Europe for two months. Traveling light is now a relative term. And go go going for 12 hours doesn’t fit with my nap schedule at all. Still, I’m determined to keep traveling with a baby. We laid low for her first year of life and we’re soon going to take her on her first big trip – a 13-hour road trip for a family reunion. Yes, we could fly, but flight prices were unsavory and so we decided to make this an adventure and see how our Little Monster takes to it. So as we count down to our first major travel with Little Monster, here are a few of the things I’m coming to terms with about traveling with a baby. You can bet your booty I will be doing my best to make sure Little Monster still gets her naps on our journey, but I’m also prepared for some nap trouble (because Suzi has counseled me through the fact that naps might not be as predictable as they are at home). But this has actually been one of my greatest struggles with learning to get up and go with a baby. I have put a lot of time and energy and far more research than anyone might think is possible into developing the perfect nap system because we had some sleep struggles early on. This Little Monster now is well-rested and a pretty great sleeper as a result. More than anything, I’m working on coming to terms with being flexible about naps and trusting that if sleep doesn’t work exactly as planned while we’re gone that my world won’t implode. Another big thought to wrestle through is that a family vacation will be nothing like what traveling used to be – at least not while Little Monster is a toddler. We’ll do as much as we can, but we’ll need to take breaks for naps. We’ll need to figure out how to feed her on the go (time to invest in some of those little expensive pouches and see if she’ll eat them or fling them across the room…my money is on flinging). My first thought was that travel might not be fun anymore, but I’m now looking forward to the adventure of figuring out a new way to travel. Fun might not be walking around for 12 hours or spending half of the day in a museum. The fun will be in finding new things to do that we haven’t done before. This was literally the only thing we did that day, and it didn’t last long because Little Monster was tiny and decided she didn’t like the beach. Travel isn’t always easy along the way. Even I feel pretty antsy on a long flight so of course someone with the attention span of a baby will too. I’m expecting to need a fair amount of patience, but that’s okay. On flights, I used to stare wistfully out the window and chill to some tunes the whole way. Flights will probably be more about entertainment with a baby in tow. Long drives were filled with epic playlists and discussions and stopping whenever we saw something interesting to check out. 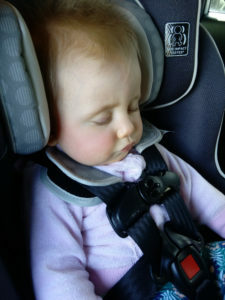 Now I’m pretty sure we’ll be jamming to the dulcet sounds of “Moana” the whole way and having to bypass interesting stops because inevitably we’ll pass them JUST as she drifts off to sleep for a nap. I like “Moana” at least. I have never been one to stop to rest much at all when I travel. If I’m paying to be somewhere else, then I generally want to get my money’s worth and see and do all that I can. Obviously, that’s going to change. As a result, it’s made me rethink some things. Before Little Monster was born, I was all, “Let’s go to Europe with her when she’s maybe one or two!” Yeah, no. That doesn’t sound like nearly as great of an idea as I thought it was – the travel time is too long, jetlag sounds like a horrible idea until she’s a little older, and I’m not sure we could fit enough into a day to make the airfare and overall expense anywhere near worth it. Destinations closer to our time zone sound better. Beyond that, I don’t plan to squeeze everything possible into a day anymore. Maybe we’ll do one thing a day, or two if we’re feeling crazy. Better to slow down than try to push Little Monster too hard. Because the fact is that she’s pretty sweet and easy going and we don’t really want to find out she has a monster side. Taking a little snooze on the go. For our upcoming road trip, I’m already thinking through what we’ll need to bring along and if it will fit into my relatively small car (it looked bigger when we bought it than it does crammed full with baby paraphernalia). In general, I’m pretty excited to teach a child how to see the world, but this is one part of traveling with a kid that I’m not excited about. 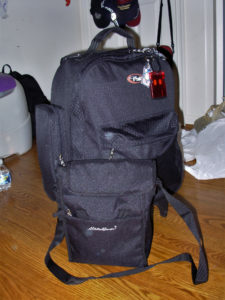 I really do hate carrying extra stuff, but there’s not a way to get around this one. Anyone traveling with a kid just has to come to terms with the fact that kids need stuff, whether it’s diapers and wipes or whether it’s entertainment and snacks. Our road trip is a few weeks out and I’ve got a host of busy toys ready to be revealed at key moments along the way. If all else fails, we also have “Moana” and a portable DVD player.